There are people out there who have actually accomplished what you’ve dreamed of doing your whole life: Professional gaming. Let that sink in for a moment. It sounds weird when you say it out loud. It’s even harder to explain to people that just don’t get it. Try telling your non-gaming family and friends about watching competitive professional gaming and see how it goes. That’s what I had to do this last weekend. I came into the Call of Duty World League Stage 1 finals at a slight disadvantage. No, I wasn’t playing. I’m not nearly good enough to even think about competing on a professional level. I was there to be witness to the event, and as someone who doesn’t follow competitive gaming, not to mention almost exclusively covers games on consoles, walking into the ESL studios in Burbank was an eye opening experience. eSports is a massive production. This isn’t a few guys streaming games on Twitch. The main studio area consisted of the stage where two teams of four played. Behind the rows of chairs set up for the crowd are a couple of couches for the analysts to talk between matches and a desk for the commentators that give in-game play by plays. Yes, professional Call of Duty has everything you would expect out of a more traditional sporting event. The back area is banks of computers and monitors, people capturing footage, creating replays, highlight reels, monitoring the game and social media coverage, and making sure the live stream looks good for the tens of thousands of people watching at home. And that doesn’t include a few back areas for teams to warm up and do interviews. If you want to get an idea of the kind of production they are putting together, scrub through the stream for Sunday’s final matches here to see what I am talking about. League of Legends. Starcraft. Dota. These are the games you’ll commonly hear associated with massive prize amounts and huge eSports productions. First person shooters have traditionally played second fiddle to real time strategy games, but titles like Call of Duty and Halo have always held a place as a competitive gaming option. With Activision’s purchase of MLG assets early this year, it’s obvious they are pushing for the industry to grow and want to have a hand in helping it gain momentum and recognition. Of course, many of their own games are already played competitively so the marriage makes sense. Specifically with Call of Duty, it is developed with eSports in mind, including things like competitive playlists and CODcaster (a spectator mode that offers ease of access to things like player loadouts, outlines of players through walls, and other features for live casting Black Ops III matches) built in at the base level, and improvements are always coming. In fact, at the Stage 1 finals, members of the Treyarch development team were talking with the casters and analysts to get a better idea of what tools they could implement to make it easier for them to have an understanding of what is going on in game and communicate that to the viewers. It’s this very deep integration that will help eSports and competitive gaming to grow, as fundamental things are added to enhance the experience for those who want to watch. Activision understands that the success of eSports does not rely solely on the extreme talent of players. 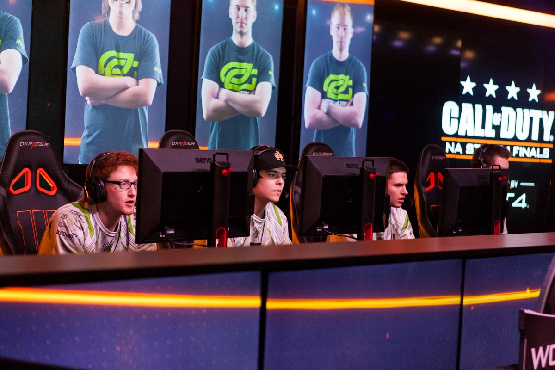 There are plenty of players out there that show on extraordinary amount of skill, and I was witness to some of the most incredible Call of Duty playing that I have ever seen. Instead, they realize that success of professional gaming rests with the people that want to watch the sport. Much like traditional sports, drawing in viewers to become invested in teams or players is what will drive sponsors to support the competition, and continue to build the advancement of something that many still view with incredulity. But when you really think about it, how different is it for someone to be professionally skilled at controlling a digital avatar versus tossing a ball around a field? It’s a very thin line, and the two aren’t nearly as separate as you may think. These teams form strong bonds with one another. They play well together. They learn to support strategies. They learn to counter strategies. They practice constantly. It’s all the same methodology found in athletic sports. They may not be able to run 70 yards for an insane touchdown or shoot a ball from half court to clinch the game, but they can headshot a moving opponent from across the map through a tiny sliver of any opening to end a match. You say tomato, I say 360 headshot no scope. It may come as no surprise when I tell you that I don’t particularly like sports. I grew up a geek, and I cultivated a disdain for athletics even though — or perhaps considering — my parents forced me onto many junior sports teams year after year. That said, I can still get behind the social aspect of sports, rallying with friends to enjoy watching the Super Bowl or other major games, but I don’t particularly care all that much, and would never choose to watch them on my own. Watching amazingly talented teams at the Call of Duty World League Stage 1 finals gave me pause to realize why people enjoy and get emotionally invested in professional sports. Before the weekend was over, I quickly realized that I was engaged at a level I didn’t think I would be. I cared about the outcome. 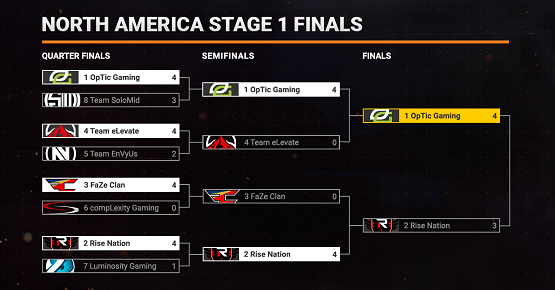 I got swept up in the excitement of the final match up between OpTic Gaming and Rise Nation going all the way to game 7, round 11 before resulting in a close shave of a win for OpTic. I watched eagerly for talented plays, mistakes, and began to learn the different players play styles without realizing that it’s the same thing people do with football. And yet I can’t explain it. It still amazes me that eSports is becoming as big as it is, and on that note, it still amazes me that a guy who throws a ball around for a living makes millions of dollars a year. But after my weekend spent watching the Call of Duty World League, I understand it all a little bit better. With the rise of YouTube and live streaming options like Twitch, the competitive gaming scene makes sense. Paired with an approach that has worked for spectating athletic sports for more than half a century may cause some to scoff, but it really does prove out in the end. We’re at a weird turning point for the world. The athletes of tomorrow may very well be gamers, building upon the success that’s been building for eSports over the last two decades. Expanding prize pools, growing viewer counts, and increased recognition for games as general media are setting the stage. Bringing in the direct involvement of gaming companies like Activision and bolstering a footprint in the console fanbase provides a unique blueprint for eSports to propagate to a wider audience than ever. It’s still a peculiar idea to many, and yet, perhaps in another 20 years we’ll be putting together fantasy teams featuring our favorite Call of Duty players each season. 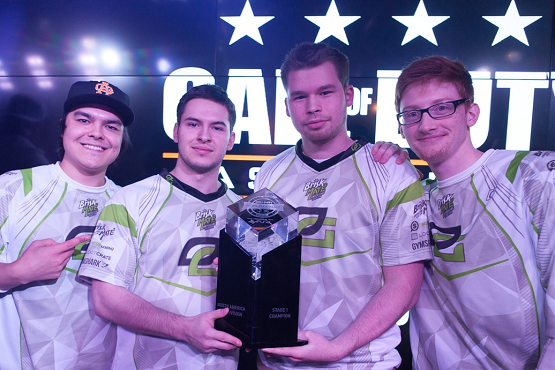 Want to check out more about professional Call of Duty or see the upcoming schedule? Visit the Call of Duty World League website here or check out their Twitter @CODWorldLeague. I want to thank Activision for bringing me out to Burbank to watch the North American Stage 1 finals and open my eyes wider to the world of professional gaming.